Vaughan Town Week 1 | Where is Weezie? I have completed my first week at Vaughan Town in Barco de Avila Spain, and I have to say it was one of the most rewarding, fun and exhausting weeks I’ve had in Europe! There were approximately 20 Anglos and 16 Spanairds here for the week. 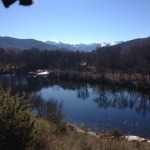 We were bussed from Madrid to Barco de Avila, about 2 hours away, to a picturesque resort in the middle of the snow capped mountains surrounded by fields of animals and a crystal clear river running through it. If is sounds magical it’s because it is completely magical! It’s in the middle of nowhere with just a small town, Barco de Avila, about 10 minutes down the road. I think Vaughan Town chooses an isolated environment so that the immersion experience is complete for the Spanairds. As you can see, it was a LOT of talking, speaking and conversing going on with a variety of people broken up by meals and group activities. While it was cold outside (about 45 deg) it was sunny and there was little wind, so during 1-to-1’s we walked outside and enjoyed the weather. It was so beautiful and it felt great to be walking in the sunshine even on cold days. One day, we had a two hour excursion into the small town of Barco de Avila. We were put into groups of five people and we had a competition, kinda of a scavenger hunt of sorts. We had to take six different pictures – one with a local of the town; one of a famous movie scene; one as models posing; one with beans; one as a famous rock band. I was in a group of four women and one man, and since his name was Mikel, we called ourselves Mikel’s Maidens. We got a pic in a garage with a group of mechanics; we posed as Charlie’s Angels for our movie scene; we went to a dried bean shop with hundreds of bins of beans and posed with the owner; we grabbed some wigs and bottles of booze and did our best rock band imitation; and we went into a hair salon and the girls posed in the mirror putting on lipstick like beauty pageant queens. Mikel’s Maidens were declared the winners of the photo competition by our peers!!! WOOHOO!! Glad I brought my bag-o-wigs with me! You can see from the schedule that we ate on Spanish time = LATE! Not having lunch until 2 PM and dinner until 9 PM about killed me! I made it a point to take rolls and fruit from breakfast each morning to snack on during the day! Plus I had my jar of peanut butter in the room along with some nuts and seeds. BUT, the chef did prepare a wonderful VEGAN menu for me, so my meals were lovely and very filling. I think I gained around 5 lbs from all the food and eating so late at night. Plus, the Spanairds like to PARTY late! After dinner, they went to the bar for more drinks and might stay up until 3 AM talking! There were several guitar players in the group, so once we started playing and singing, it went until the wee hours. I stayed up until 2 AM many nights singing and dancing with the party crowd. OMG, it about killed me. By the time the Thursday night or last night party came around, I was exhausted. I chose to go to bed early and sleep instead of going to the party. I figured they would be so drunk they wouldn’t miss me anyway. Friday morning, I felt great but boy, the Spanairds were so hungover and miserable. I was told they went to bed at 5 AM! Jeez! I don’t know how they do it. I chose wisely! It was a really fun week! I met so many wonderful people and had incredible conversations. I learned so much about Spain and Spanish culture, plus it was just a fun group! I rode with the group as far as Avila where me and two other ladies who were doing a second week departed and went to the walled city of Avila where we spent the weekend. 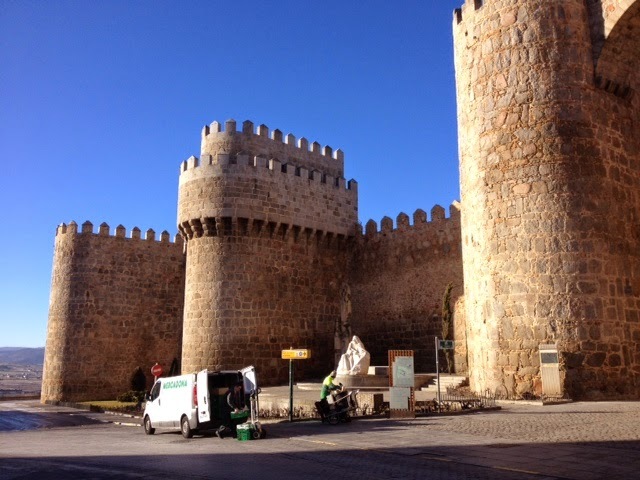 Avila is a fantastic city famous for its completely intact fortress wall and its patron saint – Saint Teresa. 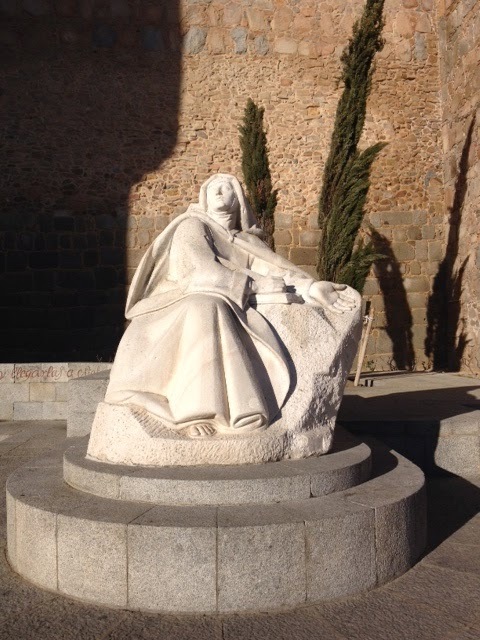 St. Teresa was schooled in Avila and later lived in the convent there. She was a mystic and author and reformer who had many ecstatic visions for which she is famous. 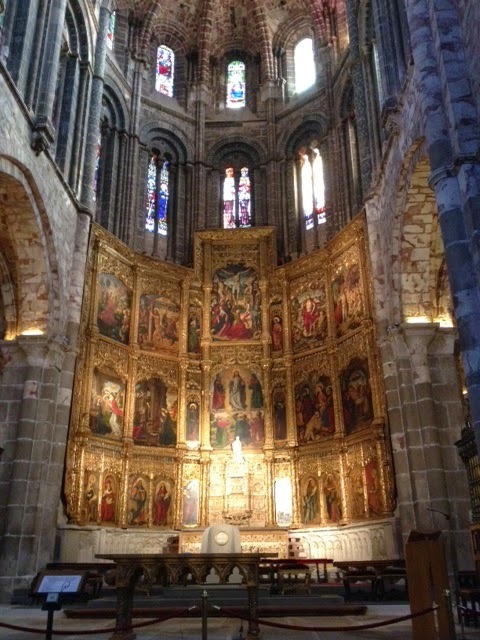 I went to the cathedral and the many churches in the walled city along with the convent of St. Teresa. It was cold but sunny on Saturday so we enjoyed the entire day walking through the city; that is until siesta when everything closes and doesn’t reopen until 5 or 6 PM. Restaurants don’t open until usually 8 PM for dinner and that is for tourists not the locals! Locals don’t eat until 9 PM or later. I just can’t get used to it. We woke up Sunday morning to the first snow of the year! It snowing pretty hard when I woke up but we didn’t get much more than a dusting. Our taxi took us back to the bus stop where we were meeting our next group of Vaughan Town prisoners, er particpants for the upcoming week. If you are interested in spending a free week with 3 meals a day at a fab resort meeting new people and enjoying the surroundings, I invite you to explore Vaughan Town and apply. It’s truly a rewarding and remarkable experience! I hope you have a remarkable and rewarding week sweet friends! More on my second week at Vaughan Town later!! Adios! This entry was posted in Happy, music, solo female travel, Travel, Vegan and tagged spain. Bookmark the permalink. Sounds so great. Best wishes from the Aloha State. So nice to hear from you John!! Yes, Vaughan Town has been fun. Just finished my second week with one more to go. It’s kinda like working on a cruise ship – new guests each week, same activities, same food and lots of it! I think I’ve gained 6 pounds since coming here!! But it’s been fun. Take care John. All the best!